When someone held in high regard speaks her mind it’s hard to ignore. But prominent Brisbane film identity Anne Demy-Geroe says she is speaking out about the restrictions on Iranian filmmakers because it means so much to her. Jafar Panahi and Mohammad Rasoulof are two Iranian filmmakers who have suffered a great deal for their art. 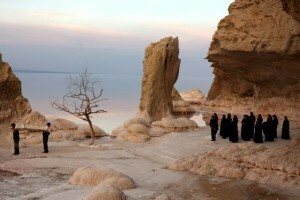 The Iranian government has sentenced the men to six years’ imprisonment and banned them from making films for 20 years. They are currently out on appeal. The punishment was for “unspecified crimes”. As a tribute, Demy-Geroe dedicated Australia’s first ever Iranian Film Festival, which opens on Thursday, to their story. She says the tribute will focus on Rasoulof in particular. “Although I’m very, very fond of Panahi’s work we felt that Rasoulof’s work had been less seen, in fact one of these films hasn’t been seen in Brisbane, the other has but not by many people,” she said. Amnesty International has thrown its support behind the two men, launching a petition with the United Nations for their freedom. Names included on the petition were Hollywood stars such as Sean Penn, Martin Scorsese and Ron Howard. Both men had films shown at the Cannes Festival, with organisers leaving a juror’s chair vacant for Panahi. The Berlin Film Festival also left a juror’s chair vacant and it seems the international film community is making its message clear. Demy-Geroe is not a woman without knowledge on Iran. She has visited the country many times and is currently working on a PhD in Iranian cinema. She says the situation facing the men is part of a wider problem. “What we felt was that it was important to make a start about this because filmmakers being put in jail are just a few of the people. Demy-Geroe says the Iranian government censor film making in the country. – everything from story-lines to the way they shoot the film. She says there are few options for filmmakers in Iran – to either target a purely international audience with their films, or a domestic audience with a censored film. “It makes a serious impact on their film making. They have to make decisions, it’s different on each filmmaker because they have to decide how their going to let that [censorship] impact their films. “Some of them just ignore it and make the film they want to make and it doesn’t get screened there and they find ways of screening it outside the country. “Others find ways around the system and many of them have talked to me about the kinds of ways they can work around the system”. Demy-Geroe was Brisbane International Film Festival director from 1991 to 2010. Photo: A scene from Mohammad Rasoulof’s film White Meadows (screening Friday).